I love inspiration shoots, and how they allow professionals and experts in the wedding industry to get their creative juices flowing. The result is always breathtaking and yet often something a bride might not otherwise have thought of. This fabulous Mid-Century inspiration shoot from Ilene Squires Photography and Party Task Force is the perfect example of just such a shoot! Who would have thought something as simple as the classic Penguin books could inspire anything this lovely…..
With a mix of modern and vintage details in a poppy palette of orange, turquoise and cerise this mod infused shoot is bright and beautiful with creative literary elements. 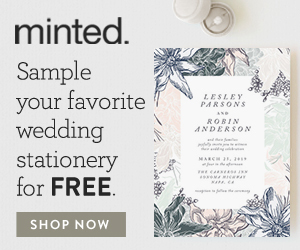 From the aisle backdrop of vintage book pages, to the stationery by Bela Morris, and the fabulous ombre wedding cake by Mayra Nunez every detail is cleverly created to bring to mind the colourful covers of the old Penguin books. The tablescape is packed with an eclectic mix of boho, modern and vintage pieces, that somehow contrast and compliment each other perfectly. Whilst the beautifully organic and unstructured floral arrangements by Valerie Jurado add a lovely romantic edge. And I don’t even know where to start with the styling, but the bride’s turquoise heels have given me shoe envy and I am sure you are going to love the tea length wedding dress with its gorgeous lace! Isn’t it fabulous? I love the lining of the groom’s jacket!! A huge thank-you to Party Task Force, and the whole creative team listed below, for bringing to life such a creative mid-century wedding. And a special thanks to Ilene Squires for capturing it all so perfectly, and for allowing me to share it with you here on Chic Vintage Brides. You can see more of Ilene’s fabulous photography on Facebook, Instagram,Pinterest and Twitter. For more mid-century wedding inspiration take a peek at this full of geometric shapes and fabulous fashion and this sweet 1950s inspired shoot . You will find both of these, and more, by clicking here. Or for real weddings inspired by the 1950s and 1960s pop across and take a look at this fabulous 1950s inspired woodland wedding and this super stylish retro affair with the most incredible portrait photos – they’re both so full of wonderful details and ideas you will LOVE them!